If you are into fountain pens – either as a beginner or advanced user – you’ll soon see the appeal of testing out new inks via ink sampler vials before committing to a whole bottle. If you only get inks occasionally or know exactly what you like, you can get them one by one from places like Goulet Pens, Anderson Pens, or Isellpens.com. But if you like experimenting and being surprised with new ink colors every month, then check out the Goulet Pens Ink Drop subscription. Every month they will ship out 5 ink samples to you based on a specific theme (check out Goulet’s Ink Drop Archives for past Ink Drop collections). 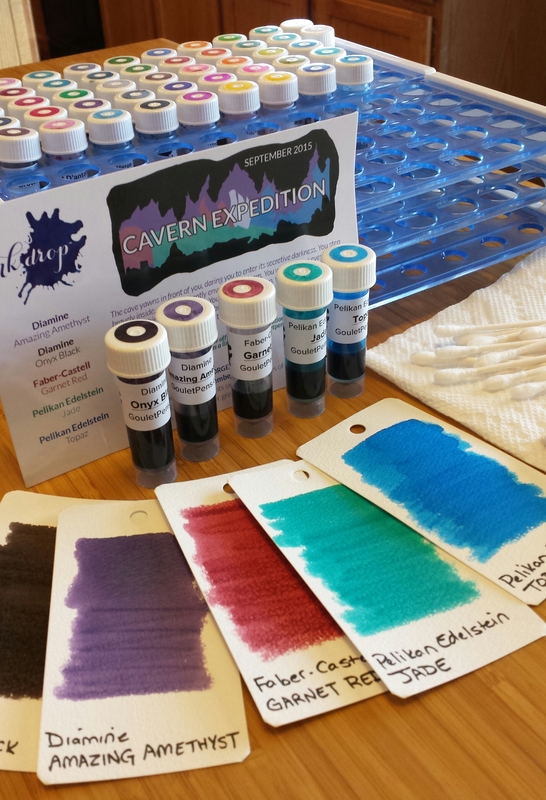 I recently received September 2015’s Ink Drop collection, and love these vibrant jewel-toned colors. I swabbed them right away onto my Maruman Mnemosyne Word Book cards. Pelikan Edelstein Jade and Topaz look especially fabulous.